EmWave technology is an innovative approach to improving wellness and facilitating personal growth based on learning to change your heart rhythm pattern to create coherence; a scientifically measurable state characterized by increased order and harmony in our psychological and physiological processes. 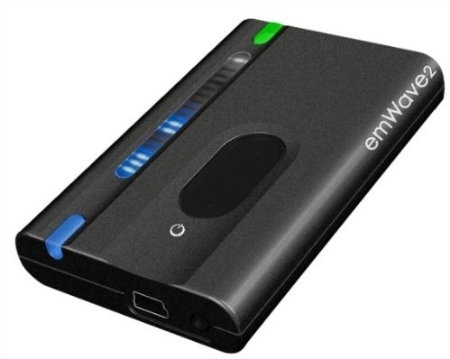 emWave technology collects pulse data through a pulse sensor and translates the information from your heart rhythms into graphics on your computer or into easy to follow lights on the portable emWave2. Used just a few minutes a day, this simple-to-use technology helps you transform feelings of anger, anxiety or frustration into more peace, ease and clarity. As you practice on the go or at your computer you increase your coherence baseline and your ability to take charge of your emotional reactions. Health, communication, relationships and quality of life improve. The emWave2 is an advanced heart rate monitor, able to measure subtle changes in your heart rhythms. This type of measurement is known as heart rate variability analysis or HRV. The analysis of HRV is a noninvasive measurement that reflects heart-brain interaction and autonomic nervous system dynamics, which are particularly sensitive to changes in your emotional state. When you experience stressful emotions such as tension, anxiety, irritation, or anger, your heart-rhythm pattern becomes irregular and incoherent, negatively affecting your health, brain function, performance and sense of well-being. When you experience positive emotions such as appreciation, care, joy and love, your heart-rhythm pattern is more ordered and coherent. Ordered and harmonious heart rhythms are an indicator of your “coherence level”. High coherence is a state associated with positive emotional attitudes, which send signals to the brain that reduces reactions to stress and improves cognitive function, hormonal balance, immune response, coordination and reaction times, and your overall sense of well-being.